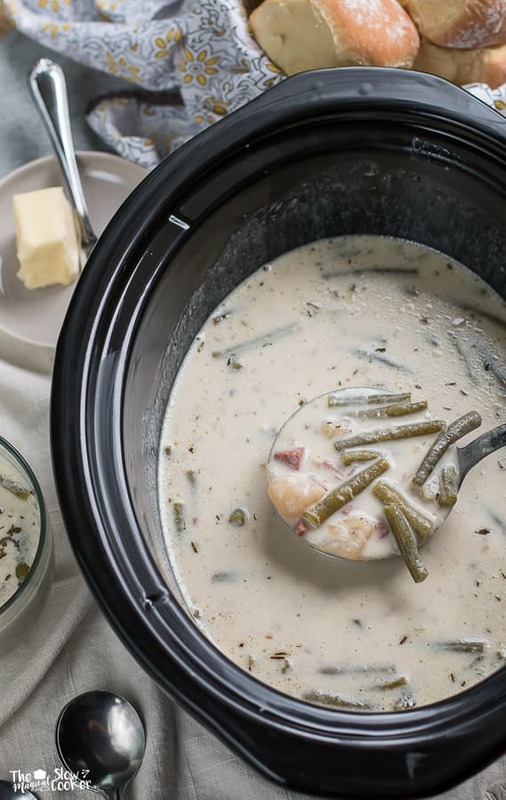 Slow Cooker Ham and Green Bean Chowder is a vintage recipe that I can’t wait to share with you! This can be cooked all day while your away. Hi Slow Cooker Friends! 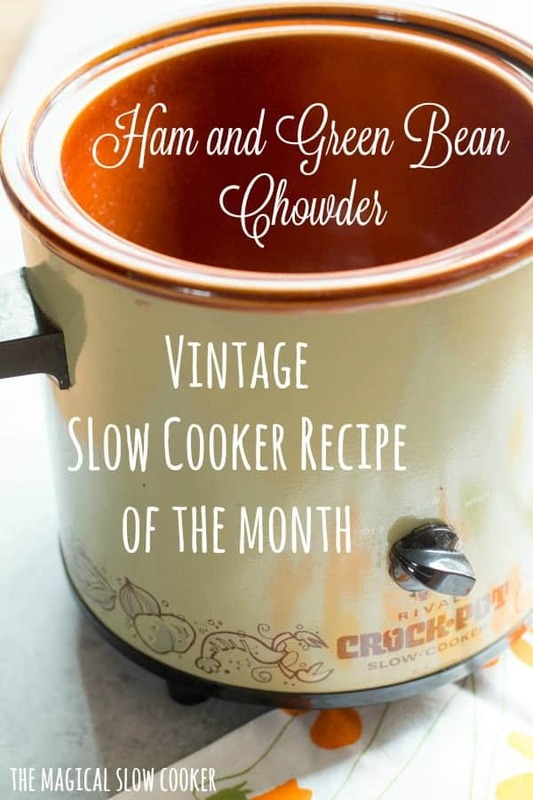 Another edition of Vintage Slow Cooker Recipe of the Month here. I am very excited to share this recipe with you. I knew it would turn out good, but it turned out to be a real winner. I adapted this recipe from Linda at Grandma’s Vintage Recipes. Linda is a grandmother of 7, she is also an avid collector of vintage recipes and cookbooks. What a fun website she gets to run! I made a few changes to her recipe to suit the slow cooker. I used cream cheese instead of using a roux. I did not add the bacon because I would have needed to brown it, and I wasn’t feeling it early Monday morning when I made this. I thought the ham bone and the diced ham was plenty of meat for the soup. Though everything is better with bacon if you decide to add it. 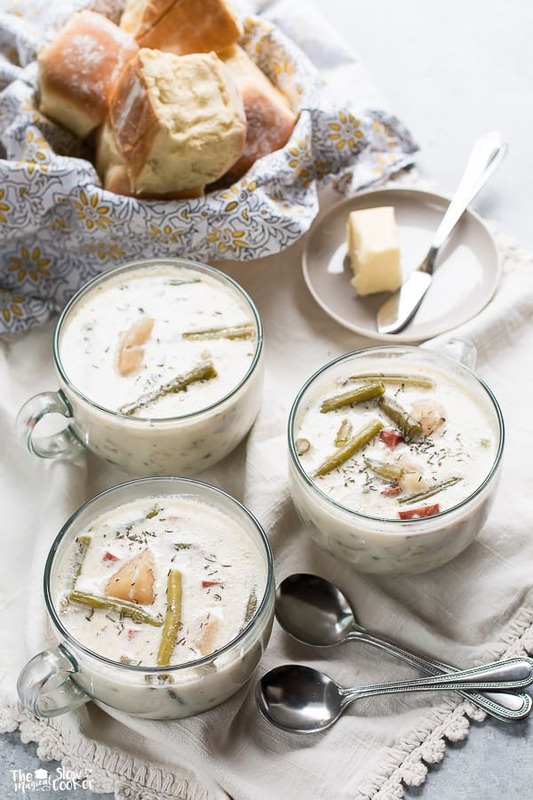 Below is what the soup looks like after the green beans are added at the end and before I add the cream cheese. 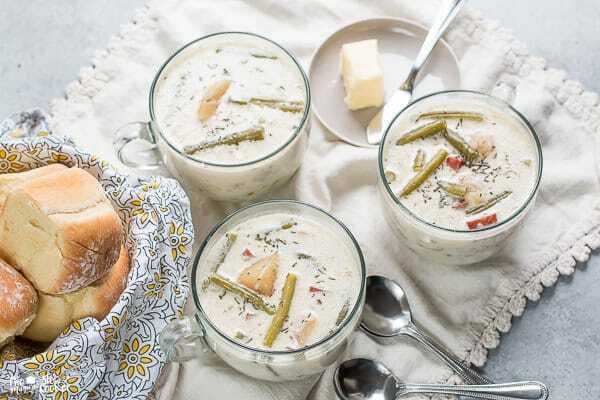 I often see slow cooker soup recipes where the cream cheese is plopped in at the end of the cooking time. I prefer to take a few ladles of the soup stock from the slow cooker and blend that together with the cream cheese in a blender. It makes for a silkier soup if you do it that way. The last recipe I posted I mentioned I was going away to a conference. I had a great time! I attended a photography class from Matt Armendariz and his partner Adam Pearson. I’m amazed about what a great team they are. Adam is a food stylist, he would spend a bit of time chopping veggies, garnishes etc. and would he would arrange the food effortlessly. Then Adam would set the food down in front of the camera, maybe add a fork and napkin then Matt would snap a couple photos (the photos were perfectly lighted and crsip). For me it was a learning experience to plan way ahead before taking a photo, which will be a goal of mine this year. The last day of the conference was a terribly busy day for me, I got into the hotel room very late. I looked at the hard bed with the giant pillows that are way too big for my head and decided to pack up and go home. At midnight I drove 2 hours home just to sleep in my own bed. It was so worth it! I love to travel, but I really need to sleep in my own bed with my pillow that is sized appropriate for my head. Have a great weekend! I will be back early next week with another recipe. 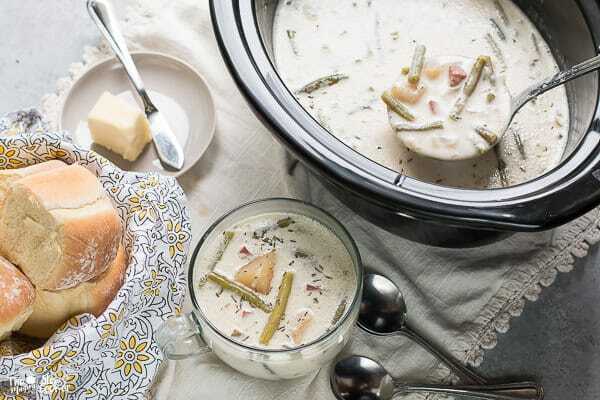 Place everything except the cream cheese and green beans into a 6-quart slow cooker. Cover and cook on LOW for 7-8 hours. 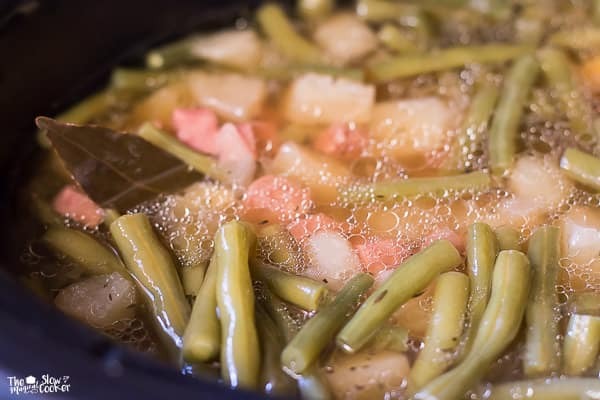 During the last 40 minutes add the green beans, cover and continue cooking. Remove bay leaves, and ham shank or hock. Remove meat for ham shank or hock if desired and add to the soup. Take a couple ladles of liquid from the soup and add to a blender. Add the block of cream cheese to the blender, cover and pulse until smooth. Add this creamy mixture to the soup and stir gently. Serve and enjoy! 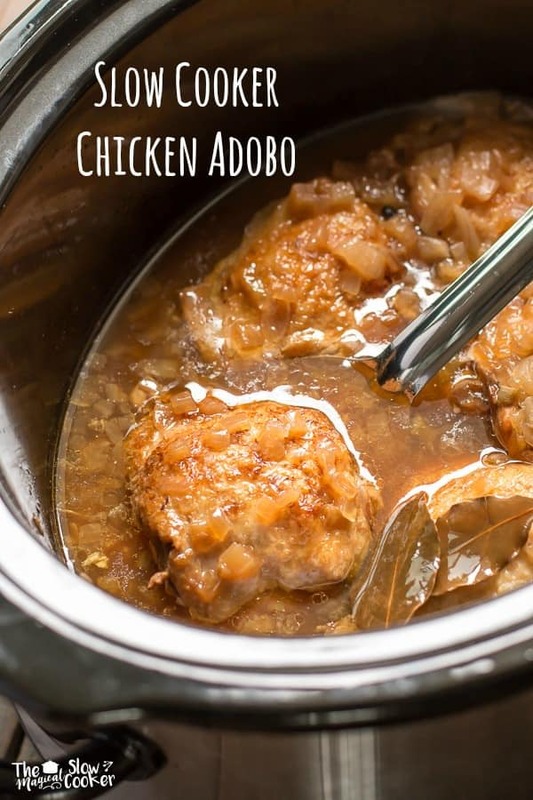 I used my 6-quart slow cooker for this recipe, but this would it fine in a 5-quart.